According to a reference in Gowlands “The Antiquities of Ripon & Riponshire” there is evidence that Boxing matches were organised in Grewelthorpe during the 18th century. There is a story that illustrates the Dean of Ripon, Dean Waddilove’s zeal as a magistrate. Hearing that there was to be a prize fight at Grewelthorpe, the Dean went there with two special constables and destroyed the stage. The Ripon Town Clerk and a land surveyor named Humphreys had gone to Grewelthorpe to see the fight, but they were made the unwilling instruments of stopping it because The Dean swore them in as special constables for that purpose. Note: Dean Robert Darley Waddilove was born in Boroughbridge in 1736. It seems that there was more to the story of the boxing match in Grewelthorpe than previously reported. The match was to be between Jem Belcher, the champion and Joe Berks and lead to the Riot Act being read in Grewelthorpe. Boxing was illegal in England at the time and despite this prize fights frequently took place. Berks was a butcher from Shropshire and first entered the ring against the champion in 1800 when, in a drunken state he attacked Belcher at a match. Belcher invited him into the ring and took 20 minutes to finish him off. Some onlookers thought Berks had acquitted himself well and fancied seeing him fight in a more sober state and a series of fights then took place. An account written at the time describes the scene.June 1802, the battle to take place upon a wooden stage to be erected at the little Yorkshire village of Grewelthorpe, about six miles from Ripon, between the hours of twelve and two. The object for selecting this place was that it was between the West and North Riding, so that if magisterial interference occurred, it would be easy to move from one jurisdiction to the other. To cut a long story short, the stage was erected, the money staked, the men were on the spot, and a swarm of spectators in position to see the great fight on this particular Thursday, June 17, 1802, and everybody was on the tip-toe of excitement. Then came an incident which dashed their hopes. Lo and behold, arrived the Dean of Ripon, accompanied by quite an army of justices of the peace. They announced their determination to prevent the fight. The crowd only jeered at them, however, for they were determined to have their day’s sport, come what might. Finding that they were so determined, the magistrates ordered the town clerk to read the Riot Act, but still those assembled jeered and treated the whole matter as a joke, for there were no soldiers to hand, and the score of police had no earthly chance of arresting anybody. The Dean and the justices then retired to consider what they should do next, whilst the mob clamoured for the fight to commence. Jem Belcher, with Joe Ward and Bill Gibbons, his second and bottle-holder, mounted the stage, and was soon followed by Berks, accompanied by Elisha Crabbe. Then came the question as to what had become of Harry Lee, who was to officiate as Joe’s second. After some delay it was discovered that Lee was there, but had point blank refused, in the face of the Dean’s interference, to fill the post of second, and Berks refused to have any- body else to act for him. Matters came to a dead-lock. After a tremendous squabble, interspersed with yells from the angry crowd, Belcher offered to have a friendly bout with Berks for the mere love of the thing, ignoring seconds and stake money , but the latter declined, and immediately set off in a post-chaise, amidst the groans of the multitude. Of course, there was an end to the affair, as far as it went, and Belcher was the hero of the hour. Mr. Fletcher Reid presenting him with £50, and £5 for his expenses to London. All the papers spoke in favour of Belcher, exonerating him from blame, and condemning Berks’ actions. But a letter appeared in the Oracle and Daily Advertiser, dated July 1, 1802, which put a slightly different complexion upon the matter. The Grewelthorpe fight was arranged for 17 June 1802 and the following newspaper reports give us a feel for what went on. To the Editor of the DAILY ADVERTISER. Sir, The wager for which I was to have fought with Belcher, at Grewelthorpe, in Yorkshire, was 1,450 guineas a side, Captain Fletcher betting upon me, and Mr. Fletcher Reid upon Belcher, the match was to be fought between twelve and two. I had wished to fight before the hour named, to prevent the interposition of the magistrates , for though no man can more respect their authority, which I would not attempt to resist, I thought it would be fair enough to get a start of them. Mr. Bolton, of York, held the bets, to the amount of 2,900 guineas. I had been in training seven weeks at Middleham, and was never in better condition. I ran and leaped with many people, and always beat them. I was exceedingly well treated by the people there, and must say that Captain Fletcher behaved amazingly well, and like a gentleman to me. I told him it was not for the sake of money, but of my honour, that I wanted to fight. Belcher had not been ten minutes on the stage, when two or three gentlemen came and told him to get off, for that the magistrates had issued their warrants. 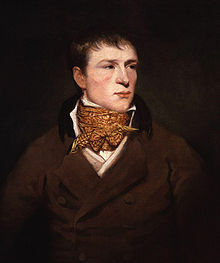 Jem Belcher (15 April 1781 – 30 July 1811) was an English bare-knuckle boxer and Champion of All England 1800-1805. Born in Bristol, Belcher beat Paddington Tom Jones in April 1799 in the Middleweight Championship of England. He drew with champion Jack Bartholomew in a 51-round bout in 1799, and won the rematch in the following year to become champion. He lost an eye in 1803 whilst playing fives, and evaded challenges to his title until 1805 when he lost – in eighteen rounds – to Hen Pearce. In 1807 Belcher returned to the Prize Ring and lost to the outstanding new talent Tom Cribb in 31 rounds. Virtually ruined by the huge gambling losses he sustained at this fight he caused a fracas after the bout, for which he spent four weeks in prison. He died in London in 1811, a broken man. Tom Cribb defeated Jem Belcher in 1807. At the end of the match between Cribb & Gregson at Moulsey Hurst, Jem Belcher spat angry words at the new champion, whose lack of skill led him to believe he could come back and regain the title, even if he did have only one eye, and even if Cribb had already beaten him once. Accordingly, the match was made and Cribb beat him again. Pierce Egan called the closing stages piteous and dreadful with Belcher, his hands bleeding and his arm broken, taking a hiding.